Dr. Bill and Dr. Lena Gerwick lead the Gerwick lab and have developed an effective style that builds on their respective strengths in chemistry, molecular biology, innate immunity and microbiology. Bill describes himself as “incredibly lucky” to be working with Lena everyday, because despite the complexities it can sometimes create, they “get the chance to interact on such a multi-dimensional way.” It is, however, the interdisciplinary nature of the Gerwick lab as a whole that makes them a unique group of scientists. Dr. Bill Gerwick sees the lab’s interdisciplinary qualities as valuable because “it is at the confluence of a variety of disciplines where one finds a rich interface that is ripe with opportunity and innovation. We consciously try to create that interface in the context of a lab through the basic application of biology, analytical and organic chemistry, pharmaceutical sciences, molecular biology and biosynthesis.” By bringing together an expertise in these varied disciplines the lab has been able to explore the unique chemical adaptation of marine algae and cyanobacteria and how those adaptations might be useful in a variety of biomedical or biotechnological applications. 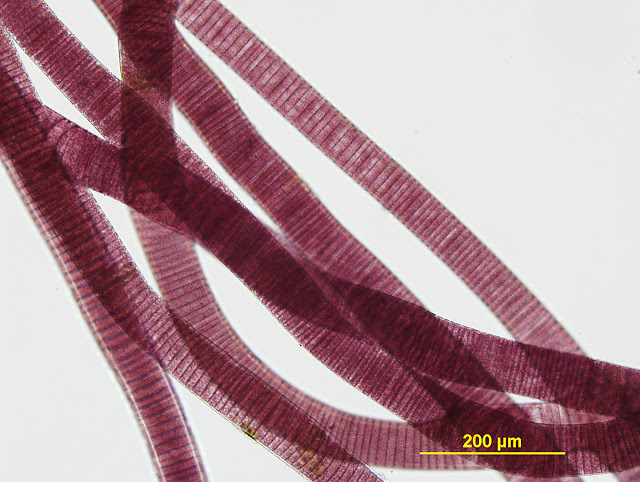 The isolation and identification of natural products from marine algae and cyanobacteria has been a major focus of the lab over the last 25 years. This effort has yielded compounds like Curacin A, an anti-cancer drug candidate that is active against colon, kidney and breast cancer cell lines. The compound was isolated from a filamentous marine cyanobacterium from Curacao in the late 90’s and the unique structural characteristics and activity it possesses has driven the lab to investigate the biosynthesis of this molecule and learn more about its activity against cancer cells. Moorea producta, the cyanobacterium that produces Curacin A, also produces a variety of other novel secondary metabolites. The lab recently sequenced the genome of this cyanobacterium to investigate the pathways involved in producing Curacin A and these other secondary metabolites. The results of this sequencing project were recently published in PNAS and can be found here. The lab plans to maintain their effort in drug discovery while joining forces with SD-CAB and applying their expertise in organic chemistry and molecular biology to biofuel applications. Growing interest in developing algae as a source of biofuels has opened up many opportunities for the lab to explore new projects that connect their work in natural products to biofuels. For example, the biomass that remains after the algae has been extracted for fuels may contain compounds that could be used for other biotechnology applications like a pharmaceutical. These compounds are commonly referred to as “co-products” and members of the Gerwick lab are actively working on identifying potential co-products. Separately, the lab is working more directly on biofuel applications using cyanobacteria and diatoms. Emily Trentacoste, a 3rd year PhD student in the lab is investigating lipid pathways in diatoms with hopes to identify ways to increase yields of triglycerides that could be converted to biodiesel. Cameron Coates, a 4th year PhD student in the lab is investigating hydrocarbon biosynthesis in cyanobacteria. Cyanobacteria naturally produce hydrocarbons that could be used as a jet fuel directly at about 1-2% of their dry biomass and it appears that they are making these hydrocarbons from fatty acids. He is investigating the unique enzymes that cyanobacteria use to produce these hydrocarbons and hopes to engineer these enzymes into microbes that would eventually produce a large yield of high quality fuel that could avoid the costly and energy intensive steps of converting fatty acids and triglycerides into diesel or gasoline. Interestingly, one of these hydrocarbon producing enzymes was discovered as a direct result of the investigations into the biosynthetic pathway for Curacin A, thus creating a direct connection between the labs work on natural products and biofuels. It is just this type of finding that reinforces the interdisciplinary approach of the Gerwick Lab and will continue to fuel their future research for years to come. Cameron Coates is Ph.D. candidate at UCSD and a volunteer writer for SD-CAB. You can contact him at rccoates@ucsd.edu.